Williamsburg, NY - The city broke ground today on the first phase of Bushwick Inlet Park on Kent Avenue between North 9th and North 10th Streets in the Greenpoint and Williamsburg neighborhoods of Brooklyn. Mayor Bloomberg said the 28-acre park is part of a broader effort to transform the city’s waterfront. 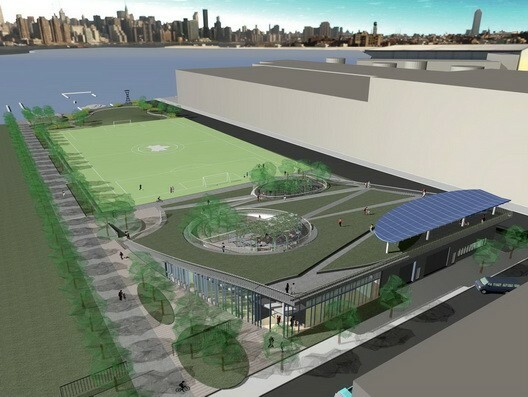 “Across all five boroughs we’re working to bring our waterfront back to life, and Bushwick Inlet Park will be the latest, but not the last, new park we’re bringing to this part of Brooklyn,” said Mayor Bloomberg. The park’s first phase will include the construction of a synthetic turf multipurpose field for soccer, football, lacrosse, field hockey, rugby and ultimate Frisbee. Funded with $7 million from the city, the field lies from North 9th Street to North 10th Street, between Kent Avenue and the East River. The site, a former rental car storage lot, is situated at the southern end of the planned park, and is adjacent to East River State Park. The first phase of the park is expected to be completed next year. We need more playgrounds, less ball parks. you seem to forget (or want to forget) that people besides frum yidden live in these neighborhoods. If you don't want to use the park, then don't use it. There are plenty of people out there who enjoy getting fresh air & exercise who will use the park. We all do! The more parks the less crime! “ We need more playgrounds, less ball parks. I guess today is the day that anyone with any challenges can post on VIN...who needs more parks? All of us do...my kids play in the little leage and they have to shlep for 30 minutes each way for a ball field. This is great new for all in the neighborhood, except obviously for you who doesn't believe in parks. Yes we all need more parks, but now? Where is the money coming from? Tickets tickets and more tickets, taxes more taxes and more taxes. The City has so much money? let them do away for now with the spending and lower our taxes, so people have more to spend and boost the economy again by getting people to spend. Parks are not a luxury for this neighborhood. It's a necessity. Our community STIll has alot of environmental problems and parks are the mitigation for those problems. If the City doesn't spend money on Parks and green space, it'll end up spending on additional health care for asthma, asthma & more asthma! Inhalers, inhalers and more inhalers! very smart!! now it'll be more places 2 go air out!! To me, a park is a place with swings so that children can enjoy themselves. There aren't any parks like that in Williamsburg. I've been to 4 parks in williamsburg with swings in one shabbos. Franklin, Taffee, Lynch, Division. What the heck are you talking about? During the week most of us go to Manhattan parks etc. to avoid negative chassidisha people who have serious staring & judgemental issues. All the negative rap Williamsburg gets is so unbelievable. Why don't you move to Kiryas Yoely where you can stare at trees all day long.